Restaurant & Café Supplies offers table bases that combine stylish looks and unmatched durability! Table bases do a lot for your restaurant. They provide a stable foundation for your patrons to enjoy their evening. Depending on how they’re designed, they can also have a big impact on the aesthetics of the facility. They’re versatile as well, and able to be used everywhere from schools to offices to businesses. We offer plenty of different options for any stylistic preference and anyone who wants a durable product they can rely on. 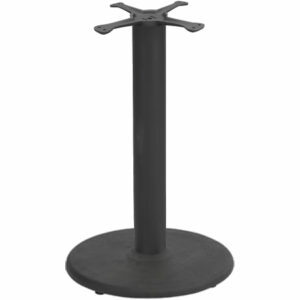 One of the most common table bases is the pedestal base. Not only do they have a look that fits right in at any restaurant or café, but they deliver sturdy quality at an affordable price. The T-base is another popular choice. This sturdy model can support a heavy-duty table without requiring complex setups or bulky hardware components. The T-base is great for providing plenty of support without crowding up the floor beneath the table. For those who want a base with a little more flare or an antique look, the LION ornamental option is a great choice. These bases are extremely durable despite their antique appearance. The elegant design is also eye-catching and can stand out in almost any setting. The round metal base offers a sleek look that can match nearly any room design while providing plenty of support – it’s also very easy to install! Check out our inventory below and outfit your restaurant, café, or any other type of facility with beautiful and reliable table bases.